A small but perfectly formed bunch of IBG'ers tonight, including a return from Sean, and an inaugural appearance from Gary, who had escaped the domestic bliss of Ealing to be with us for the first time this evening. Quality rather than quantity tonight, with camels, trains (sort of) and rebuilding London being the order of the day. A quick card game for the early arrivees. Jon played the Philip strategy (take everything and hope the right numbers are in the deck…..they weren’t) as did Philip. Barry didn’t do badly for a first attempt but it was Tom who played his cards right and ended up with the best score. a pub overlooking the Thames, it was decided that there would be an even split amongst these fellows. Four stayed within the confines of London whilst the other four jumped aboard a train to Wales, although there needed a lot of rubble to be cleared before they'd reach their destination. Snowdonia was only on the games pile because Tom had bought Woody's copy. Tom wasn't up to speed with the rules and Woody was in Wallace Country, so rules explanation fell upon Phil's shoulders as a two game veteran. The boy did good and after 30 minutes of set-up and going through the key rules, we were on our way with the Snowdon scenario. Certain rules would crop up now and again, especially concerning the events but a post-match review of the forums on the Geek showed that we played it pretty much correctly. Other than having too many trains available but that was no matter really. Phil immediately tied his colours to the mast by consistently moving his surveyor forward at least one space until he reached the summit. This was assisted somewhat by a brief onset of fog and early rain which kept the excavation and track laying abilities to 2 and below. Tom followed suit briefly but by the end of the game only acquired 4 points for his surveyor compared to Phil's 21 points. In the meantime, the others were getting to grips with the relevant actions with perhaps too much emphasis upon material acquisition and not enough upon acquiring and satisfying contracts. Throughout the game, Jon kept a steady hand on the tiller in all respects and after acquiring his train early doors, seemed to have an endless supply of coal which he put to good use in keeping his drunken sot of a labourer out of the pub. There was a regular turn over of ore for iron bars which were put to good use by him in constructing various stations and tracks. Tom soon acquired his No. 2 Train, Enid, with a view to using her to cheaply acquire iron bars for track laying which would in turn satisfy certain of his contracts. Unfortunately, he had not reckoned on Jon and Andy both jumping first thing on to the Works, preventing Tom from converting his large ore supply into an iron bar for the upcoming Train Maintenance. Next turn and two white cubes are drawn out of the supply bag (by Tom, of all ironies) and Enid was lost. It was only a brief affair but sweet. Tom is sure that he will be riding Enid again up the mountain soon enough; however, after than cruel blow, he couldn't look at another locomotive again and ended the game a train spinster. Disregarding this stroke of bad planning on his part, soon enough Tom was back in the game as, thanks to some sunny weather, the excavation level was back up to three and he was able to excavate twice at double the rate (thanks to one of his contract cards). This netted him 12 rubble (meeting one of his high contract cards) and also assisted in getting bonus points for excavating two station spots. Andy, in the meantime, was motoring along nicely despite briefly being tempted by the siren call of Phil's surveyor. He had been the first person to acquire a train (No. 3 Wyddfa) and this was greatly assisting his track laying and building efforts. But then, the coup de grace. Both surveyor contract cards were revealed. Phil seemed to be the only one interested in them and no-one, in Jon's words, "took one for the team" in seeking to deprive him of either. Phil of course took both and would achieve them both (just) before game end. This resulted in a windfall of 50+ points to young Philip, a tidy sum. Finally, after a bit of stop and start, the game was now motoring along with events dealt with without fuss and the weather engine kept ticking over by the team of Jon and Phil. The game decided to work against the players laying a significant amount of track (thanks to the sunny weather) and building a couple of stations too. Soon enough, the end was nigh. Some frantic building (and surveying out of necessity) ensued and the last track was laid. So now for the slighty bitty (but rather fun) gradual scoring process. There was a fairly even spread on contract points with only six points between Phil's 42 and Tom & Jon on 38. Andy had taken his eye of the prize with the contracts and was out of the running. This led to scores of: Tom - 72; Phil - 71; Jon 75; Andy - 55. Ah, but we've forgotten those poor surveyors freezing their proverbial walnuts off on the side on Snowdon whilst most of their fellows relax in the pub with a warm ale or heat themselves against the burning coals of Tom's beloved Enid. Phil's surveyor had scaled the mighty peaks of Snowdon whilst the others' hadn't even open their packed lunches for the hike. This resulted in Phil winning the day with a mammoth score of 91. Tom and Jon were almost inseparable with 76 & 75 each whilst Andy was kicked out of Cymru with his score of 57. Four budding architects took on the monumental taks of rebuilding London's streets post the Great Fire in the shape of Martin Wallace's 2010 game, London. And it says much about today's globalisation that the task was entrusted to those from North America as well as those native to London (as well as the rogue West Midlander). The game is a balance of acquiring districts (on the board), building up your city (your card tableau) and running your city (using your card tableau), whilst all the time managing poverty and pauper levels, your money and not losing track of the need to acquire VPs. Cultural differences soon emerged - Barry and Sean taking an expansionist approach and building large cities and taking on large amounts of debt (at least in Sean's case), whilst Woody and Gary tried to manage with much smaller cities to keep the poverty at bay (such compassion! Perhaps less compassionate was Gary's use of Millbank Prison to get rid of three paupers from his hand.) However, whilst Woody expanded quickly taking over a number of boroughs, Gary's natural disinclination to take on debt to expand restricted his options. The rebuilding took most of the evening - newbie ignorance and some thematic filibuster brought on by the combined availability of Parliament and University of London cards contributed to lengthen what should probably be a pretty quick game (sorry, Woody and Barry!). But gradually districts were taken and cities built and run - we were even visited by a sightseer half way through, who seemed to like what they observed - how thematic is that! Eventually Sean triumphed. It looked as if his early gifting of Parliament to Barry might be a terrible mistake, but his debt laden expansionist policy eventually brought him the delights of the Stock Exchange, streetlamps, hospitals, Parliament, University and many other iconic central London buildings. Woody meanwhile was intent on cleaning up his London streets to remove all the poverty from his manors, which he did successfully leaving everyone else to suffer the shame (and lost VPs) for their remaining poverty. Barry constructed a most impressive new London, including that Whitehall card, and was the first to get the Underground built, but, incomprehensibly, on the final count they brought him few VPs! Gary's strategy (ha, what strategy!) imploded as his unsustainable early city was never properly built over and left him stuck in the past. Though it transpired that one important rule had been played incorrectly (cards in hand count towards poverty when running your city), so I'm calling it all null and void and asking for a replay…. Is there a message here for current Government economic policy? Too much fiscal constraint is not necessarily a good thing and borrowing more to spend more may be the winning strategy… at least in the world of Martin Wallace's London! brought out this game which was apparently a hit with his wife. A fine recommendation indeed! 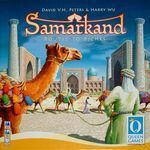 It is essentially a sort of cross between Chicago Express, Paris Connection and a game where you pick stuff up… The general idea is that you buy into families which then gives you the opportunity to expand their camel trains across the board, picking up tokens and meeting other families as you go. There are several ways to score points – meeting other families, connecting to icons you have cards for and good old fashioned cash. The set-up is a wee bit fiddly (slight understatement) but Tom’s careful bagging policy did make it a bit easier. At the beginning of the game, Tom and Phil both started controlling the same families in the same areas of the board, leaving Jon alone in the central region. This enabled them to expand quicker, and start to generate more income, whereas Jon made rather a plodding start. However, Jon was soon able to manufacture meetings between families that only he controlled, which was enough to encourage Philip at least to spread his wings and join in. The game concluded when Jon helped the ‘brown’ family (the “Arabiens” to their friends) make as many meetings as the game allowed, and the scores were totted up. It is one of those games where it is difficult to tell who has done well (partly because a good portion of the scoring is hidden until the end), but it turned out to be a very close finish, with Jon just pipping the others to the win. Tom mentioned at the end that he felt that the game played better with 2 or 4 players, so it will be interesting to have another go with one more player. Certainly a fun way to spend the last 30-40 minutes of the evening! And that's all folks - see you next week!